Saying 'thanks' is not as easy as people think. 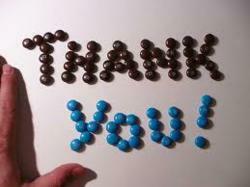 B>U offers simple tips when saying thanks to those who made a difference in one's life. Giving thanks can be a confirmation of a deep and wonderful truth. Almost everyone has that teacher, neighbor, coach or friend that made a special impact in their lives growing up. But most people don't thank them for having such a positive impact, so B>U challenges those to reach out to say thanks. November is the month for giving thanks. But how does one take those small steps to finally say "thank you" to those people they haven't seen for years? In today's world finding people and communicating with them has never been so easy. Or has it? Just because people are easy to find doesn't necessarily mean it's easy to reconnect, especially if they haven't talked to them for years or decades. About.com author Cherie Burbach offers some advice when contacting people that they haven't talked to in years. She recommends to manage expectations before contact. They may be caught off guard or not respond. One recommendation is to write a letter or e-mail thanking them. This way, they have time to respond when and how they want. But, always remember the goal of the contact is to say "thanks" for making a positive difference. And, if the conversation stops there then the goal has been achieved. But, something else may happen. They may return the feelings and friendships rekindle. No matter what, that one word "thanks" made the difference that was intended. B>U Conductor Richard May issued the challenge to himself and spent one afternoon tracking down his piano teacher he hasn't talked to in twenty years. She had no phone number listed so he wrote an old fashioned letter saying thanks. "My piano teacher and the patience she had with me through those years is the reason I still play today. When I finished recording my first EP, she was the one that I thanked in my heart but not to her directly," reflects May. "When B>U wanted to dedicate November to encouraging people to say thanks to those that made a difference in their lives, she was the first one that came to mind." "As soon as I dropped the letter in the mailbox, I had an enormous relief and sense of joy inside. So, take it from me that saying thanks to an old friend or inspiration is an incredible moment." According to nueropsychologist, Dr. Rick Hanson, some people receiving thanks can be awkward. Wondering whether the "thanks" is really deserved. But giving thanks to those can be "a confirmation of a deep and wonderful truth." BGreaterThanU.com recognizes the vulnerabilities of emotions when revealing such appreciation which is why November's B>U challenge is to reach out and say thanks to those special people that made a difference and watch how it makes them feel greater than themselves. And then watch how that same feeling is returned through those efforts. It's a win-win, say B>U. B>U is an aspiration business that encourages and promotes individuals to take one small step at a time to better themselves that, in turn, makes a better world. For more information, go to BGreaterThanU.com.